The man behind the counter (whom I'm assuming is the owner) is loud and boisterous, telling me it's too hot to drink coffee. But I'm adamant and sit at an inside table bathed in sunlight coming through the adjacent window. Pretty soon I'm just a bit too warm in my long sleeve shirt with another shirt underneath. I'm grateful for the shot glass of water that is brought with the coffee to slightly offset all the abounding heat I have surrounded myself with. Déja vu, the coffee is in a black cup on a black saucer accompanied by a black tube of granulated sugar -- they all say "Florio" on them. 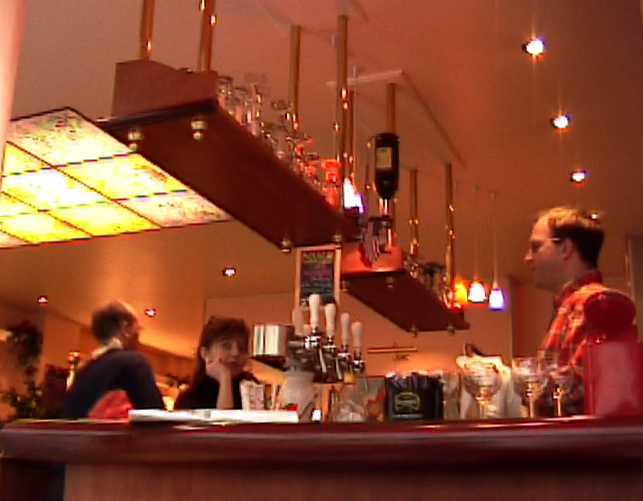 When an American woman comes in who the owner knows and he starts talking to her in perfect english, it becomes obvious why he seems so un-French. He is American! Later he tells the woman (and everyone present) a story about when he and his wife (also present and seemingly French) were in another restaurant they own in the south of France (in Aix-en-Provence, I think), and his wife broke sixty ashtrays in a fit of anger. The wife laughed at the story and said in French (she never spoke English while I was there) that she didn't regret it, and that it was cheaper than breaking plates. The man's regret seemed to be that the incident happened just after they had cleaned the restaurant. Several times while I am there the owner says he was about to close, but the customers kept coming in. Indeed, people seem to walk in the door every few minutes even though the cafe is not on a busy street and it is after the normal lunch hour. 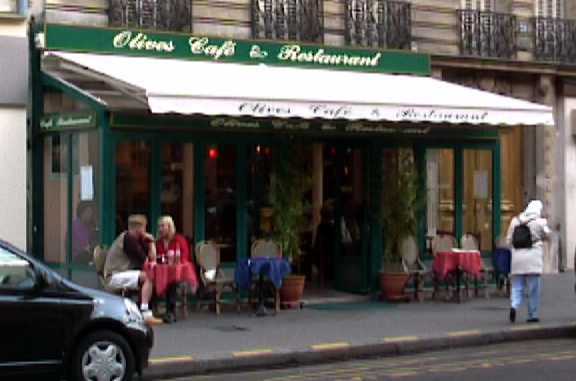 A blonde woman whose French is not too good comes in and asks for the toilet (it is possible she was sitting at one of the tables outside), and she is told in English where the restaurant's bathroom is. Later a man whose French is not too good comes in and asks the same question and is told in English that the toilets are completely underwater but that there are facilities available down the street in either direction. An Italian quartet sits down at the table next to me. The tables are relatively big and round with pinkish granite tops and golden rims. The chairs are cherry-stained wood with red seat cushions. There are large paintings of vases filled with flowers on the walls, along with a couple of posters of Cannes and Menton. The sun has dipped behind buildings, but when it was out there was always someone sitting at one or more of the unshaded tables outside. The meal portions here look generous and other than the slightly annoying boisterousness of the owner, the atmosphere is actually quite pleasant. Copyright © 2003 David Sadegh.